A freshly paved cycle track in Almetyevsk along the city's main street, Lenina. What a difference a year makes. In October 2015, Copenhagenize Design Company was hired by the City of Almetyevsk, in Tatarstan, Russia. We were no stranger to the task - developing bicycle strategies is one of our primary jobs. We didn’t realise at the time what kind of visionary client had hired us. In this earlier article we called it the Transformation of Almetyevsk. One year on, that title seems like an understatement. The status quo in many Russian cities. No infrastructure. No protection for cyclists. 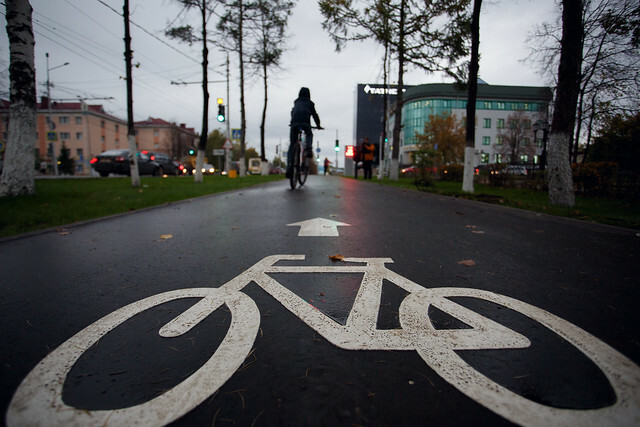 We were - and are - quite familiar with the state of cycling infrastructure in Russian cities. On a global scale, Russia has struggled to reestablish the bicycle as transport in its cities. What most often lacks is real political will in recognizing the bicycle as a legitimate mode of transportation. In Almetyevsk, however, that would prove to be the guiding strength. Ayrat Khayrullin is the young, ambitious mayor who acknowledged the importance of a holistic bicycle strategy that values world-class facilities, constructive communication strategies and above all, dedicated cycle tracks. 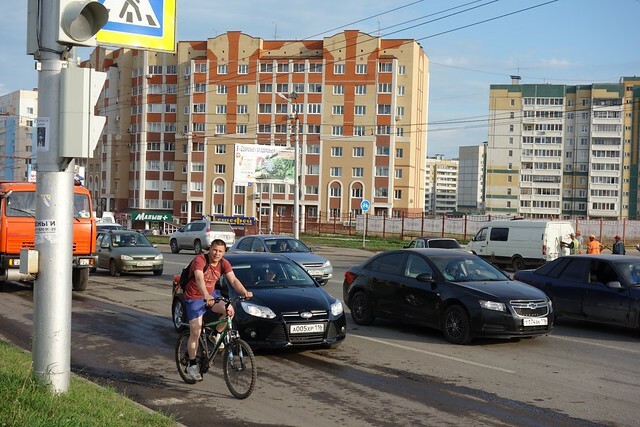 From the get-go, Khayrullin expressed one clear goal: to transform Almetyevsk into the most bicycle friendly city in Russia, one where he would feel confident sending his young year-old son off to school by bike. From left: Almetyevsk Mayor Ayrat Khayrullin, Copenhagenize Design Co. CEO Mikael Colville-Andersen, Rosa our translator, James Thoem, Senior Planner with Copenhagenize. First site visit in 2015. 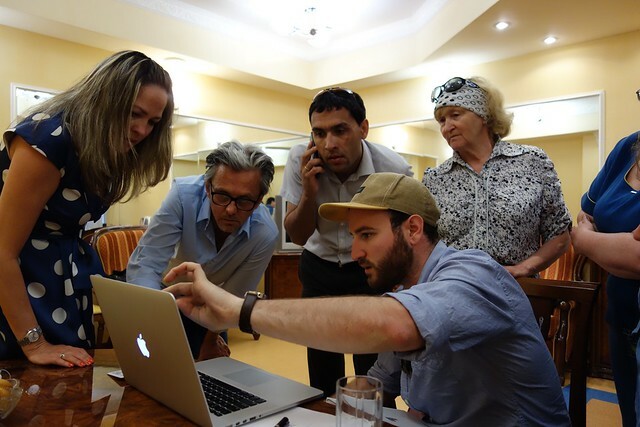 In our preliminary meetings with the city, we quickly agreed on the process and the goals. 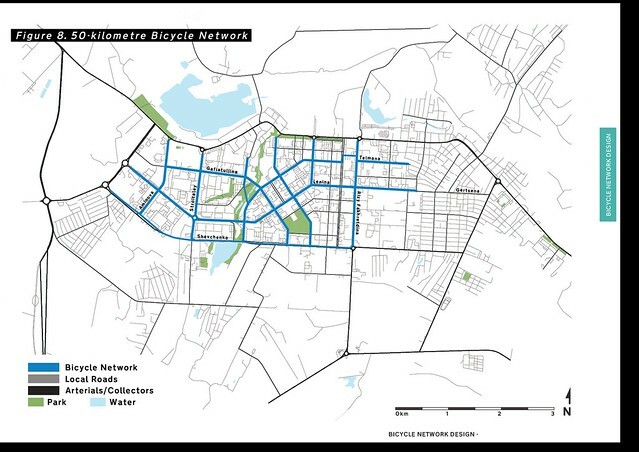 200 km of bicycle infrastructure in a cohesive network of Best Practice infrastructure. Nothing less. Khayrullin had done his homework. He knew, for example, that on-street, bi-directional cycle tracks were a sub-standard solution. He understood the importance of a complete network and prioritizing cycling as a transport form. He was well-versed in the health benefits of having a cycling population. All he needed was someone to design it. To create the gold standard bicycle city in Russia. The entire Copenhagenize Design Co. team went to work - not only our staff in our main office in Copenhagen, but with help from our offices in Brussels and Montreal, as well. Time was short. At our meetings in the city in Fall 2015, we were told that they wanted to get to work in Spring 2016. We divided up our work on the bicycle strategy into stages, in order to give the City a chance to plan and prepare their engineering department for the work. Their challenge was to figure out how to best use the roadworks season - from April to September - to create the first 50 km of hard infrastructure. 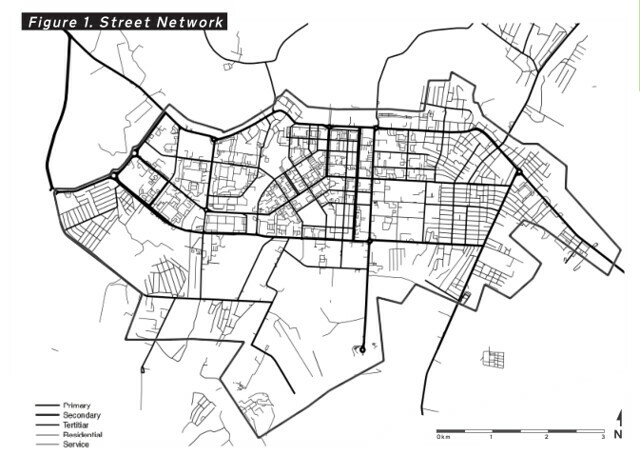 The core network along the city’s main streets. 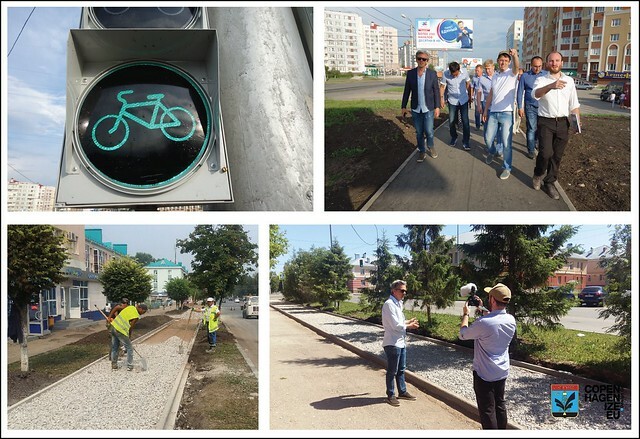 Selected photos of the new infrastructure and bicycle network in Almetyevsk. Best Practice design. One-way on both sides of the street. Complete with the bling of cyclist garbage cans, footrests and handrails and bicycle counters. Yes, Almetyevsk. Let’s create some context for this place. It’s a city of 152,580 people located smack-dab in the middle of Tatarstan - a semi-independent republic in the Russian Federation. Our colleagues in Russia inform us, grudgingly, that Tatarstan is a place where things just get done in an urban development context. The capital city, Kazan, is the only Russian city to have built a subway system since the collapse of the Soviet Union, although they have done very little for bicycles as transport. As Almetyevsk is projected to grow by 30,000 new residents (many of them young workers and families) by 2030, the administration is looking to improve overall livability and attractiveness. Mayor Ayrat Khayrullin is keen to attract new residents with a life-sized city, as well as improve the quality of life of those who live there already. Map of the street network of Almetyevsk. The city’s built form is characterised by an arterial ring road framing the residential, cultural, and commercial centre along a grid-like street network, with Soviet-era roads so wide they make Salt Lake City's streets look like a back alley in Amsterdam. The city centre measures eight kilometres from east-to-west, four kilometres from north-to-south. In other words, the city’s relatively small footprint with dense network of medium and high-rise residential coupled with wide roads presents plenty of opportunity to accommodate the bicycle as a mode of transport. When we first arrived in the city we were amazed at how many pedestrians there were - something you don’t often see in Russian cities. In addition, a thriving trolleybus system is a main transport form. As we know, these two elements are low-hanging fruits when designing for bikes. All the great bicycle cities in the world have excellent public transport and a strong pedestrian culture. The financing of this €3.6 million phase of the project was a unique public-private partnership. Tatarstan’s national oil company TatNeft bought into the idea early on and their enthusiastic backing - both moral and financial - was key to the success. Their headquarters are in Almetyevsk, as well. It only makes the storytelling better. A city in the heart of the Russian oilfields, with hard winters, decides to copenhagenize in two short years and the sixth largest oil company in Russia helps finance the visionary project. Like many Russian cities, Almetyevsk had dabbled in bike infrastructure but, as is often the case, half steps and compromises have only led to conflicts. The city was quite open in admitting the shortcomings of their existing infrastructure. The shared pedestrian/bike spaces often resulted in confusion and conflicts, while the cycle tracks contained within a new development district didn’t connect to the greater city network. 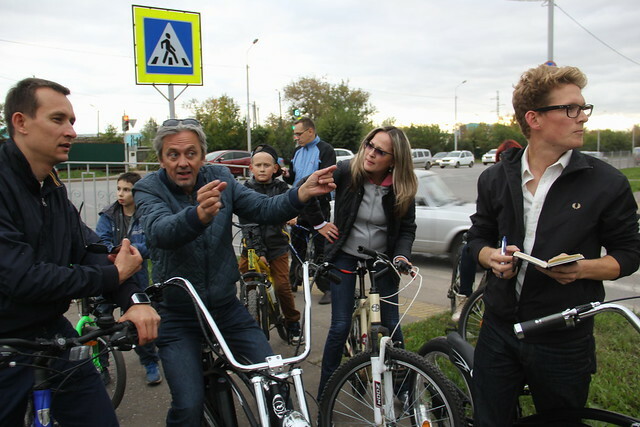 In fact, conflicts between pedestrians and cyclists in 2014 heightened the public discussion around the role of cyclists in Almetyevsk, prompting the mayor and his colleagues to look outwards for experienced help, rather than crack down on cyclist behaviour. Pre-existing bicycle infrastructure in Almetyevsk. Bits and pieces and sub-standard bi-directional lanes. After multiple site visits for consultation, documentation, and data collection, we returned to Copenhagen to begin analysis. Taking a detailed look at the city, with tried and true methodologies, we built up a thorough understanding of the city, developing an understanding of the strengths, weaknesses, opportunities and threats facing the development of a connected network of bicycle infrastructure. We analysed the connectivity of the network, the destinations and origins, intermodal linkages, road typologies, and beyond, gradually building up an understanding of how best practice bicycle infrastructure could fit into the city streets of Almetyevsk. Perhaps one of the more transformative events of the whole process was welcoming the mayor and a small team to Copenhagen for a private Master Class . Through workshops, talks, guest speakers, and bicycle tours, we opened their eyes to how best practice infrastructure functions. Nothing beats watching as wide-eyed traffic engineers and planners wake up to the potential of the bicycle. With a strong baseline understanding of Almetyevsk and a freshly inspired project team in Almetyevsk, we developed a vision for a not-so-distant future Almetyevsk: “A place where the young and old, rich and poor, can cycle alongside one another on a safe and connected network of best practice bicycle infrastructure.” Some more quantifiable goals will help in guiding this vision forward into the future. 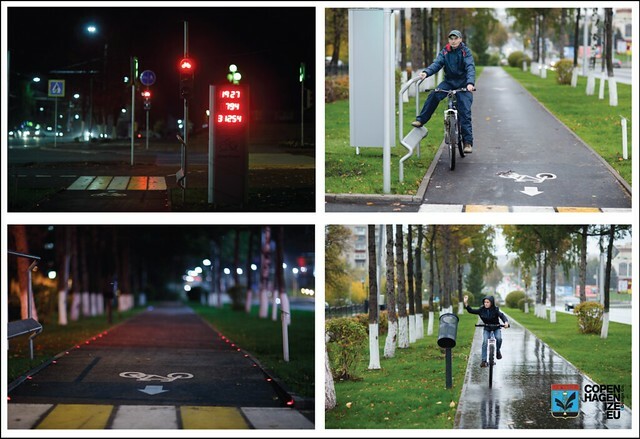 Working off our baseline insights study and a guiding vision, we worked alongside a project team in Almetyevsk to develop the city’s first Bicycle Strategy, one that guided the city forward in laying out 50 kilometres of bicycle infrastructure in 2016. Laying out an appropriate first phase network and addressing smaller design details appropriate for each identified street typology. Details such as bus stop treatments, major and minor intersection treatments, and appropriate bicycle parking solutions were explained. Complementing the physical infrastructure our strategy also laid out soft infrastructure strategies, turning towards communication campaigns to encourage cycling, school and workplace programming, public events, and future engagement campaigns aiming to get people on their bikes for the first time, a critical step in expanding ridership. The network map by Copenhagenize Design Co. for the City of Almetyevsk. The first 50 km built in 2016. Construction on the project began in late May, 2016, coinciding with Russia’s annual bicycle parade day and a ribbon cutting ceremony. Upon our arrival in the city on that visit, we did numerous site visits and saw how the foundations were already laid for several kilometres of bicycle infrastructure. It was an amazing sight. On May 29, 2016, the Bicycle Network was launched. The next day, however, was unforgettable. Over 1000 residents on bikes came out for a bicycle parade through the city. We stopped at a location on the main Lenina Street where an asphalt machine was waiting. Copenhagenize Design Co, Mikael Colville-Andersen, together with Mayor Ayrat Khayrullin and former heavyweight boxing world champion - and current member of the national Duma - Nikolai Valuev, shovelled cement into the foundation for the first bicycle sign, spread asphalt on the first stretch of cycle track and watched as young activists pressed a large, red button to start the paving machines. The City launched a massive communication campaign about the coming bicycle network. Billboard campaigns for the city’s vision even hung above where the infrastructure would soon be rolled out - a part of the City's comprehensive communication campaign. Implementing bicycle infrastructure and facilities in Russia had its challenges. There is nothing in Russian road standards about Best Practice bike infrastructure (there will be now), as the city engineers kept mentioning at the beginning before political leadership took the reins once and for all. The quality asphalt required for cycle tracks existed, but the city did nonetheless a series of outdoor tests to make sure they had selected the right one (they had). Along a piloting stretch of road, the Director of Transportation in Almetyevsk showed us the different materials, surface treatments, and signage they were trying out. They hadn’t had any luck finding a supplier of bicycle traffic signals in Russia. So what did they do? They made their own using vinyl stickers and traditional signals. They made bicycle railings and footrests and tilted garbage cans for cyclists as well. Taking their lessons from the Copenhagen Master Class, the director and his staff had begun experimenting and, as a result, pushing the boundaries of the status quo on Russian roads. 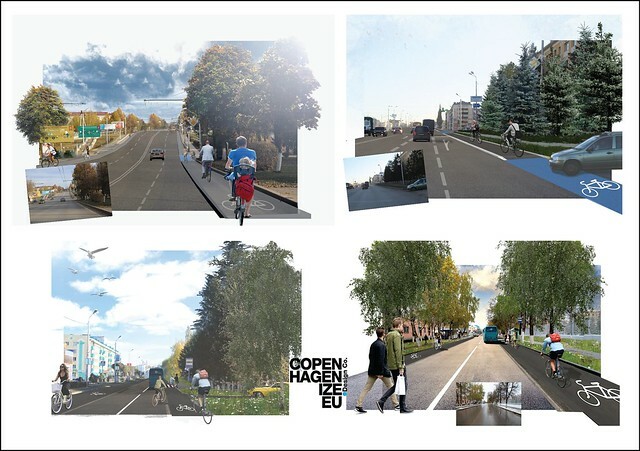 Selected renderings from Copenhagenize Design Company's Bicycle Strategy for the City of Almetyevsk. By Chris Noir. There were hurdles to overcome along the way. While political leadership was key, traffic engineers still needed convincing. In order to perform studies about density, connectivity, space syntax analyses, etc, Copenhagenize Design Company needed local data, but Russian cities do not have the same data gathering culture as, for example, Scandinavian cities. In addition, a lot of the existing data was classified as secret - echoes of the Cold War persist. Nevertheless, the challenges were overcome. At the end of the day, the City of Almetyevsk turned out to be the most amazing client. We would receive emails from the street, where asphalt machines were rumbling along, to double-check about how to proceed - followed by photos the next day showing what had been done. That kind of client relationship is like nothing we’ve ever dreamed of. Every night since May we knew that when we woke up in the morning, more metres of fresh asphalt in the form of Best Practice cycle track would be cooling off in the dry, Almetyevsk air and the quality of life in the city had improved. 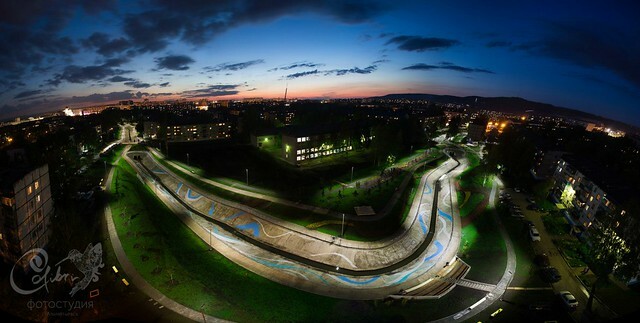 Shamsinur - an urban park designed by Kazan design agency Evolution. Mayor Ayrat Khayrullin hasn’t restricted himself to bicycle infrastructure either. In 2015, together with Kazan design agency Evolution, he created Shamsinur - an urban park that has become an amazing destination for the citizens. In 2016, a massive water park opened in the city as well. You can see photos of the other urban design projects in this gallery on Flickr. By establishing themselves as first movers within Russia (and beyond), Almetyevsk has gathered attention from policy makers that may be weary of looking outside the federation for best practice. By seriously investing in a network of dedicated bicycle infrastructure, Almetyevsk has positioned themselves firmly as the gold standard of a bicycle friendly city in Russia, simply by learning from over 100 years of best practice infrastructure in Denmark. Knowledge transfer at its finest. And it doesn’t stop here, the city looks forward to building a total of more than 200 kilometres of infrastructure that will connect all neighbourhoods and beyond. There is a centuries old saying in Russian that everyone knows. “There are only two problems in Russia: fools and roads”. Copenhagenize Design Company and the City of Almetyevsk just might have finally solved the latter. It is a wild ride that continues into 2017 and beyond. Quite possibly the most exciting urban design project in the world at the moment.